Nowadays, Tony Petitti '83 enjoys all the football he can handleâ€”as well as golf, tennis, and basketballâ€”as Executive Vice President of CBS Sports. He was promoted in November, after serving as Executive Producer for three years. Nowadays, Petitti enjoys all the football he can handleâ€”as well as golf, tennis, and basketballâ€”as Executive Vice President of CBS Sports. He was promoted in November, after serving as Executive Producer for three years. As Executive Vice President, Petitti oversees the daily operations of CBS Sports, handles the acquisition of new programming (the network recently secured a new six-year deal with the PGA Tour to remain the dominant broadcast network with 20 events each year), and maintains relationships with current rights' holders for the NFL, Super Bowl XXXVIII, the NCAA Men's Basketball Championship, the PGA Tour, the Masters, the PGA Championship, college football, and the U.S. Open Tennis Championships. He still performs his Executive Producer duties: staffing on-air talent and production personnel, creating and approving graphics and set design, purchasing and developing new technology, supervising event coverage, and monitoring editorial content for all programs. With Sean McManus, President of CBS News and Sports, Petitti also serves as Executive Producer of the NFL on CBS. Petitti, who currently lives in Westchester, N.Y., with his two daughters, 11-year-old Danielle and seven-year-old Alison, began his sports broadcasting career as a legal eagle. An economics major at Haverford, he graduated from Harvard Law School in 1986 and worked two years at the law firm of Cadwalader, Wickersham, and Taft before joining ABC Sports in 1988 as general attorney.“I saw it as an opportunity to work at something I loved,” he says.“I knew I didn't feel that way about law.” (He hasn't practiced since 1991.) He later became Director and then Vice President of Programming. 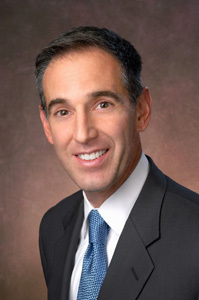 The development of the unprecedented Bowl Championship Series raised Petitti's profile in the world of sports broadcasting, and in 1997 he was hired by Sean McManus, then the new president of CBS Sports, as Senior Vice President of Business Affairs and Programming, managing such activities as contract negotiations. In this position, he was instrumental in the network's reacquisition of the NFL in 1998. “That was a real team effort,” he recalls.“We were constantly creating presentations and pushing our agenda. Every day I would go home and wonder if we really had a chance at this deal.” Since the NFL negotiates broadcast rights every six to eight years, Petitti knew that CBS would have a long wait ahead of them if the deal fell through.“We found out that the letter (securing the broadcast rights) had been signed on a Monday night, and the next morning it was on the front page of the local papers.” Given the amount of armchair spectators who opt to watch football games from the comfort of their living rooms, this achievement was a huge ratings coup for CBS. Petitti has won three Emmy Awards. In 2004 the network's coverage of the Masters' Tournament was named Best Live Sports Special (â€œIt's like our version of Best Picture”) and received an award for Outstanding Short Feature for part of that year's Super Bowl broadcast. In 2003, CBS Sports won Best Live Turnaround for its showing of the Tour de France. Petitti himself was named one of Sports Business Journal's“40 Under 40” top industry executives in 2000.